Hotel Kursaal & Ausonia is a boutique-like, eco-friendly hotel in Florence (Tuscany, Italy). 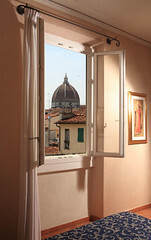 Hotel Kursaal & Ausonia's rooms convey the warm, relaxing atmosphere of a traditional Florentine home. * Others have double glazed/sound proofed windows to ensure maximum tranquillity even in the heart of the city. All guest rooms have been carefully renovated to offer a unique blend of modern design and antique handcrafted furniture.